After our morning session inside of our Riad, we ended the day on the roof with Nemanja and Darija. She wore a gorgeous sequin dress (like out of this world beautiful). 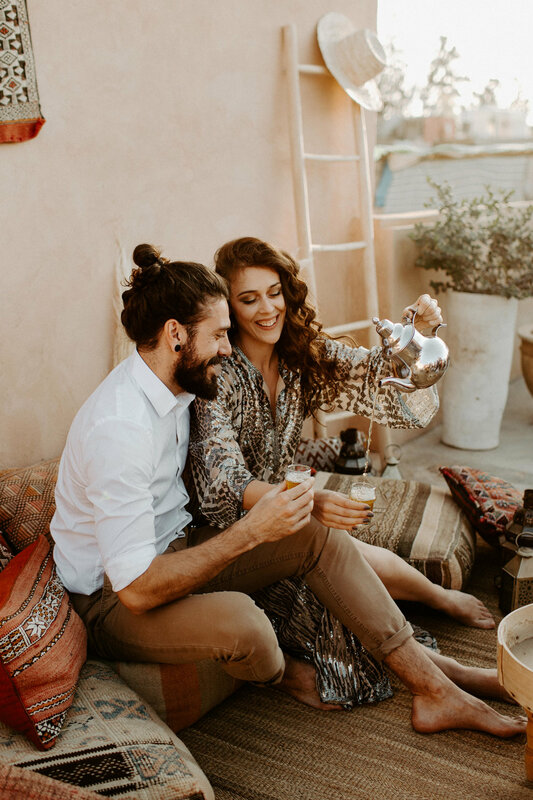 They cuddled up in some Moroccan poufs and pillows and had some tea. The sun went down behind the buildings and we spent the right of the evening chatting over bread and wine. One thing I learned in Marrakech is how much tea is a part of their culture. Moroccan mint tea in particular is something you will find everywhere. It’s made up of fresh sprigs of mint and dried green tea, it’s not uncommon to add quite a bit of sugar to this tea (traditionally sugar is a sign of wealth). One thing I completely loved about the experience is how they pour their tea. Traditionally from a teapot called a berrad, it is poured high above the tea glass- it’s exciting and effortless. The tea will fall into the glass creating bubbles but not splash and is to be enjoyed with your friends. I LOVE learning cool facts like this about other cultures!